Official Transcripts are available for email or mail delivery at a cost of $15 per transcript. Processing time is generally 1 - 2 business days for electronic transcripts and 5 – 7 business days for paper transcripts. 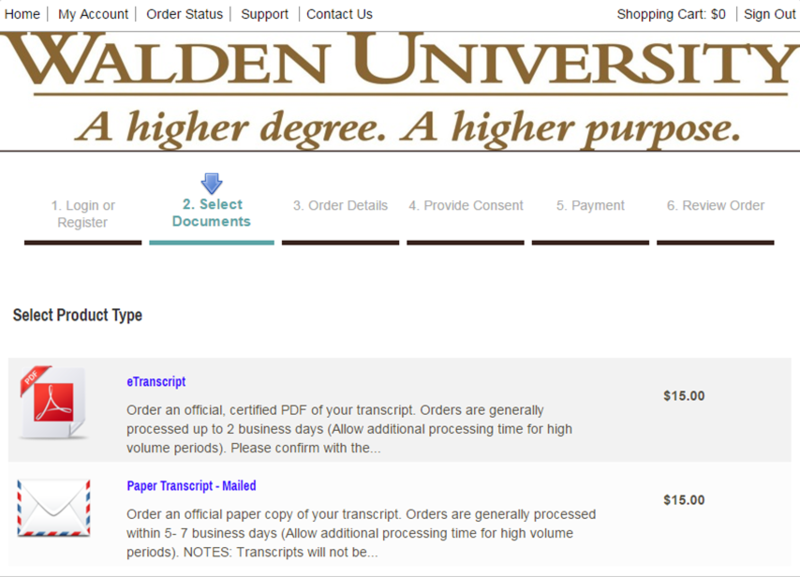 Expedited shipping is available for paper transcripts at an additional cost. Note: Official Transcripts cannot be processed if there is a hold on your account. Under the Quick Links icon, select the My Education link. Under My Education you will select Request Official Transcript. This will open the Parchment Ordering Service website so you can begin. If it is your first time accessing parchment you will need to create an account. 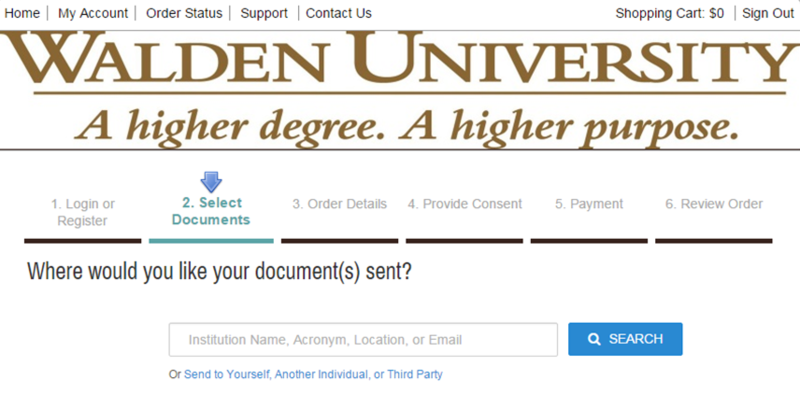 If you are no longer a student and do not have access to your myWalden portal, you can also access the Parchment Ordering Service directly from its website. First-time users will need to create an account for Walden requests, before placing an order. To do so, click on the Create Account button. When creating an account, you will be required to provide all the information marked with a red asterisk (*). Note: If you do not have a U.S. Social Security Number please enter in '0000' in this field. Once all fields are completed, hit the Submit button to create your account. You will be directed to the login page to start your transcript request. Please make note of the e-mail address and password used to create your account, as you will need this information to log back into Parchment to view the status of your order or place additional orders. After you are logged into the Parchment system, you will be asked to select where you would like to have your transcript sent. You can enter the name or email address of an institution in the search box. This will provide you with a list of schools, from which you can select the correct institution. If your desired institution does not appear on the list, you can also manually enter in the information of the institution to which you would like your transcript be sent. This option is available at the bottom of the Search results page. 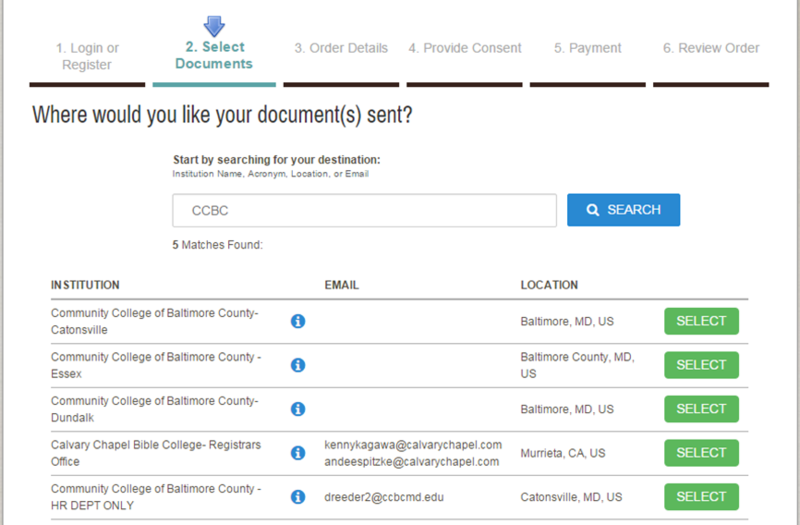 If you want a copy of your transcript for your own use, or it needs to be sent to another individual or third party (your employer or scholarship organization, for example), you can click on the link labeled Send to Yourself, Another Individual, or Third Party beneath the search box. If you have selected the option to Send to Yourself, Another Individual, or Third Party, the Parchment system will direct you to a new page wherein you can provide the mailing address for the desired recipient. After selecting the name of your desired school from the search results – or after providing the mailing information if you are sending the transcript to yourself or another individual – you will be asked to confirm which type of transcript you’d like to have sent. Note: Please confirm with your recipient that they will accept an electronic (official, certified PDF) copy of your transcript. The processing time for a paper transcript is 5-7 business days, not including the time in transit to your identified recipient. The cost for each type of transcript is $15. You are able to have transcripts sent to more than one recipient within one order. To do so, simply repeat the steps related to selecting an institution or other recipient and the type of transcript be sent for each required transcript. The fees for these additional transcripts will be added to your overall order total. You will receive a confirmation email after you have successfully completed your order. If you paid to ship your transcript(s) via Federal Express, you will receive an email with the tracking number, once your order has shipped. For more information on this topic, please contact Customer Care at reghelp@mail.waldenu.edu.